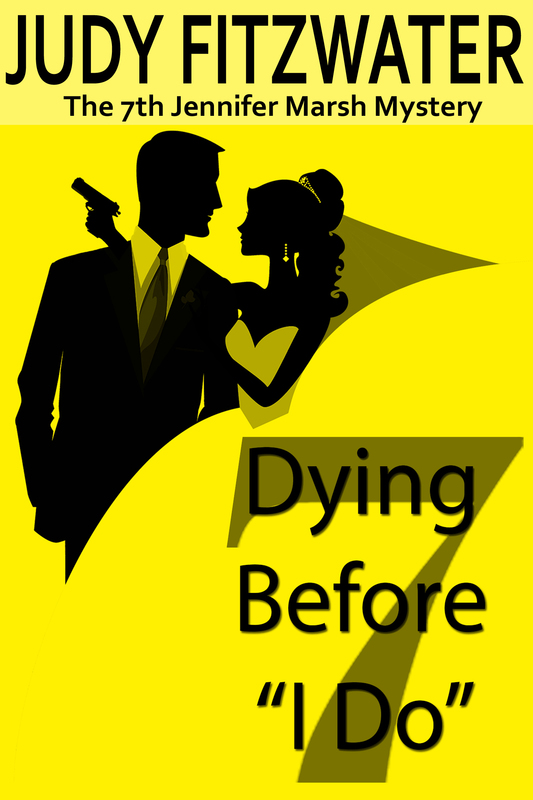 There are a lot (a LOT) of interwoven character relationships in Dying Before “I Do”, and by that I mean people who have personal and/or professional pasts with each other. It adds subtle yet rich layers to the story (think filo dough in baklava – my favorite! ), and are introduced at a rate that with enough support that they keep the story flow going. Jennifer Marsh is a great character and she brings with her a story that will have you on the edge of your seat. With twist and turns that will have you wanting more. Love and murder: two words that should never go together. But when Jennifer and long-time beau Sam Culpepper finally decide to tie the knot, murder rears its ugly head to intervene. Now Jennifer has more to contend with than choosing colors and flowers for the most important day of her life. She and Sam must thwart whoever is bent on keeping the secrets of an old kidnapping case. One man is dead, and young reporter Teague McAfee is next in line. Jennifer finds herself embroiled in a twisty tale of love gone wrong, while dodging her friends who are determined to give Jennifer and Sam the perfect wedding. 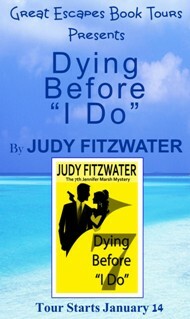 Judy Fitzwater is excited to have recently published the 7th book in her popular Jennifer Marsh Mystery Series–DYING BEFORE “I DO”! She has also just released THE ROCKY ROAD TO PUBLISHING: ADVICE ON WRITING, a fun, insider’s look at the world of writing and what it takes to be successful. 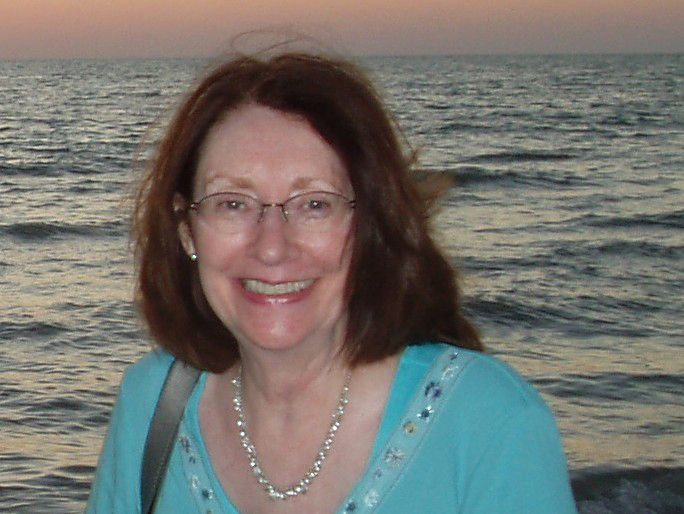 Judy grew up an Air Force brat and has lived in nine states, including Maine and Hawaii. Her first published mystery, DYING TO GET PUBLISHED, was plucked from a stack of unsolicited manuscripts at Ballantine Books. It was nominated for an Agatha Award for Best First Mystery. The subsequent seven-book series, The Jennifer Marsh Mysteries, was a delight for her to write, especially the scenes with Jennifer’s quirky writers’ group. All seven are now available in Kindle editions. Judy’s suspense thriller, DROWNING IN AIR, is now in paperback, as well as a Kindle edition! 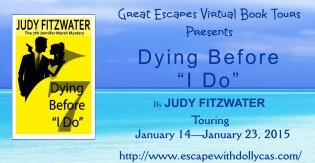 And don’t miss her very funny romantic comedy, VACATIONING WITH THE DEAD, which is filled with ghosts and mayhem. She has plans for more mystery, suspense, humor, and paranormal adventures. Please, remember that every eBook received for review from Great Escapes Book Tours is given in exchange for an honest review. The eBooks are the sole property (copyrighted) of the author and should not be sold, distributed, transferred, or exchanged with or to other people, nor should they be listed on file sharing sites. Failure to comply with this disclaimer, will result in removal from all future tours.